I was warming up a cup of tea in the microwave and somehow dropped the cup and helplessly watched it shatter on the kitchen floor. The cup was one of my favorites. I purchased it when I was in Ireland. It was a Cath Kidston mug, and I love her designs. That particular style of mug is no longer available. The mug was one of seven I own. I have given Cath Kidston mugs to Cathy, my girls, and my daughter-in-law. I’ve also given them to two of my close friends. I’ve never given a mug on a holiday or special occasion. I’ve just passed them along when it’s occurred to me to do so. When I dropped the mug, I immediately started crying. I could barely catch my breath. I cried for a long time. I wept as I swept up the pieces and carefully placed every last speck of glass on a plate. It is sitting on my dining room table, waiting for a miracle. I have a hard time crying. Throughout my life I have needed some kind of prompting to bring me to tears. Movies have been pretty reliable over the years, but to the best of my recollection, this is the first time tears have flowed after the breaking of glassware. My life is hard. Yours is too, I know. Why do we think we deserve more? Why do we take umbrage at the realization life is not fair? It is certainly more fair for white middle-class Americans than it is for countless other people groups. Why am I so offended by my losses? That is a problem to be contemplated on another day. For today, I will just cry. So many of the lives of people I love have been shattered. Some have been shattered through terrible tragedies; some through illness; some because of decisions I have made. There is too much pain in the world. Given the general sucky nature of life, I do not understand why fundamentalists feel the pressing need to contribute additional pain to the experience. One would think religion would be in the business of providing comfort, not inflicting pain. This weekend I was with friends in the Pacific Northwest who have experienced incredible pain at the hands of evangelical Christians. You can see their wounds healing. I know they could see mine. I’m sure they could also see the occasional far away look in my eyes. I very rarely look at comments posted online about anything I have done. It’s not helpful to one’s self-esteem. Yesterday I happened to see a comment someone made about my TEDxMileHigh YouTube video. They wrote just two words – “nightmare fuel.” It took me a minute to understand what they were saying. My first thought was that it was probably the comment of a fundamentalist Christian. I have my own prejudices. Whatever the source, it is not an unusual response to my story. I live it out every day. I wonder what kind of pain the commenter is in that would cause him or her to want to inflict pain on another. What deep pain do I trigger in his or her own life? The truth is I am tired of the losses. My life has been shattered and I am afraid I cannot put the pieces together again. But that is only how I feel today, as I look at the hopelessly broken shards of glass on my dining room table. Tomorrow will be a new day. And maybe tomorrow I will be able to say with Pierre Teilhard de Chardin: Someday, after mastering the winds, the waves, the tides and gravity, we shall harness for God the energies of love, and then, for a second time in the history of the world, man will have discovered fire. This was a needed read for me today. Empathy! 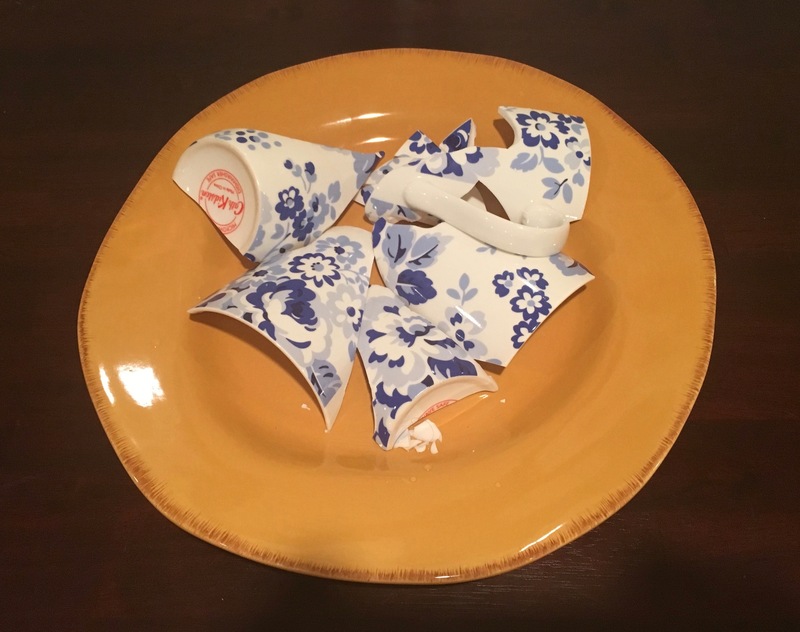 In studying the photo, I see beauty in the shards of your cup on the bright yellow plate. So, sometimes beauty emerges from the broken. I think there is a message there somewhere. Hugs. Oh my dear, how much I needed to hear this today. I’ve had a lot of broken days, especially lately, but that is only how I felt today. Yes, tomorrow or the next… You’re not a good anything in particular, Paula, you’re just good. I mean, yes, you are many good things, you do many good things, but mostly, you’re just a good person. Kindness and wisdom are pretty great accomplishments. Thank you for your vulnerability. And for being with us in Kirkland on Sunday. I hope you felt the love, just for being you, and sharing yourself with us. I treasure it. I also have a shattered life, what transgender person does not who is of age? I know and feel your pain. My tears can come at simple words I speak to my wife. Life is hard but also good. It is the good I try my hardest to focus on. I send you the warmest of hugs and prayers. All praise to God, the Father of our Lord Jesus Christ. God is our merciful Father and the source of all comfort. He comforts us in all our troubles so that we can comfort others. When they are troubled, we will be able to give them the same comfort God has given us. For the more we suffer for Christ, the more God will shower us with his comfort through Christ. <<<<<< Your LIFE and example do this for me, and U daresay fpr many others. Thank you! I came here after watching that TEDx video. It touched me in ways that I can’t express. While someone may have seen it as “nightmare fuel” I saw it as amazing and wonderful and strong and powerful. I copied lines into my daily book – “You are far more capable than you realize. You are more powerful than you know. And you reflect the best parts of what it means to be fully human.” and “The call towards authenticity is sacred, it’s holy, it’s for the greater good.” I needed to hear those words today and I really appreciate hearing them from you. Thank you so much Cercis. Those are some of my favorite lines from the TEDx talk! My friend polished shards of teacups and makes jewelry from them. You deserve nice jewelry, Paula! Loved your TED Talk…More power to you and all the women in this world.